Since the 1970s we have become increasingly conscious that energy resources are precious and limited. Thermal imaging cameras can help you to make insulation problems and other building anomalies clearly visible. This way not only corrective actions can be taken but also energy can be saved. The easiest and quickest method of detecting energy waste in buildings is thermal imaging. A thermal imaging camera shows exactly where the energy waste problems are and helps focus the inspectors attention allowing them to properly diagnose these areas of loss. FLIR i3/i5/i7 is the smallest, lightest and most affordable thermal imaging camera on the market. It is incredibly easy to use and requires no former experience. It really is a matter of "point-shoot-detect" to obtain high-quality thermal images that will immediately give you the thermal information you need. The FLIR bxx-models have an image quality of up to 180 x 180 pixels and are designed for those needing higher resolution and more features for documentation and reporting. The bxx models include the features like built-in insulation alarm and dew point alarms. The FLIR Ebx-models have an image quality of up to 320 x 240 pixels and include the features you need to make well informed building decisions like built-in insulation and dew point alarms. The cameras are specifically designed for building inspections such as, HVAC heating and cooling issues, air flow, moisture detection, insulation problems, and much more. The FLIR B-Series of portable thermal imaging cameras takes ergonomics, weight and ease-of-use to a new level. Usability is key: our engineers have translated user feedback on comfort and clarity into a series of comprehensive and innovative features. 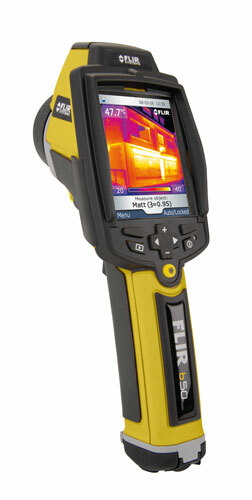 Furthermore, the FLIR B-Series has been specifically developed for building environments. It contains features like dewpoint and insulation alarms that will make the life of any building thermographer a lot easier. The FLIR T640bx / T620bx combine the ergonomics and flexibility of the FLIR T-Series with the extremely high image quality of the P-Series. The FLIR T640bx / FLIR T620bx offer a crisp thermal image of 640 x 480 pixels on which the smallest of details can be seen. An intuitive user interface supported by state-of-the-art touch-screen technology make the FLIR T640bx /FLIR T620bx extremely easy to use.